It always seems to start the same way: an innocent school dance, the most popular couple in school, and a crazy dare. But before you know it, zombies (or other assorted monsters/demons/devils) have taken over and everyone is running for the exits! But zombies and other undead creatures have come a long way since bad 80’s horror movies – it seems as though zombies (of the fictional variety) are everywhere we turn. From hit television shows to mainstream films, zombies have truly made their mark on pop culture. Beyond just fictional zombies and the undead, people are even preparing for a real zombie apocalypse. Now, whether or not a zombie takeover is imminent, you can still get in on the fun with this Homecoming Horror Costume! 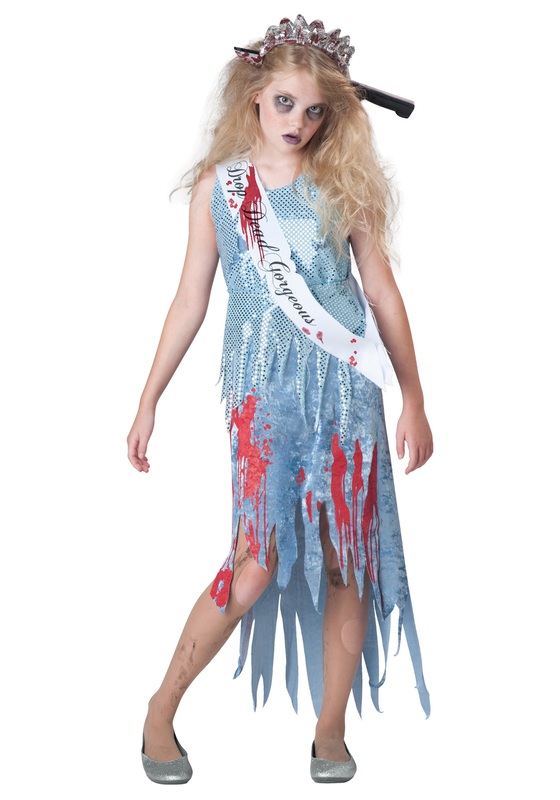 From the 100% polyester dress with printed blood stains to the ‘Drop Dead Gorgeous’ sash, this zombie costume will have you ready for your next theme party or for Halloween. No matter what, don’t forget the tiara with a connected knife to give you a look that is truly undead. Let’s be honest, we’ve all thought about become Queen Bee at some point in our lives and what better time than a high school dance or Halloween? You’ll be able to take over your next event with your lifeless eyes and ghostly appearance – everyone else will be running for the halls! Become the homecoming queen at Zombie High in this Homecoming Horror Costume! Add glittery shoes and zombie makeup to complete your look and you will rule the school – and not just because you are popular!